Olympic gold medallist Matthew Mitcham. Mathematicians, engineers and sports scientists are scrutinising the aerial movements of Olympic gold medallist Matthew Mitcham in order to help optimise the performance of divers and gymnasts. Their research Bodies in Space is one of 13 University of Sydney projects to receive a total of almost $4 million funding in the Federal Government's second round of Linkage Projects, announced today. Linkage Projects are administered by the Australian Research Council, funding collaborative research between university researchers and external partners. Bodies in Space has been awarded $165,000 over three years under the scheme and is co-funded by the NSW Institute of Sport. Its research applies geometric mechanics to model the aerial motion of athletes and simulate their movements on computers to try and improve performance. 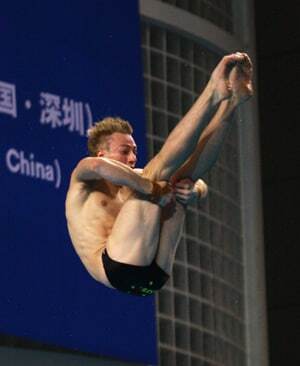 Ten-metre platform dive champion Matthew Mitcham is among the project's participating athletes. "Dropping an upside down cat from the air is the classic experiment of aerial motion," says Bodies in Space lead researcher Associate Professor Holger Dullin from the University's School of Mathematics and Statistics. "Somehow the cat can reorient itself to land on all fours even though it has nowhere from which it can push itself once dropped. "Athletes in free flight are in a similar situation; they change their shape in order to change their orientation and thus maximise performance. In crude terms, what we hope we can do with this modelling is say to a diver 'do this with your left arm at this point in the manoeuvre and you might get a better result'." While currently working with divers and gymnasts, Associate Professor Dullin and his fellow researchers - Dr Surya Singh from the Australian Centre of Field Robotics, Dr Peter Sinclair from the Faculty of Health Sciences and Dr Damien O'Meara from the NSW Institute of Sport - hope to extend their work to aerial skiing. For a full list of Round Two Linkage Project recipients go to the Australian Research Council website.